Reducing fuel around assets is considered a good hazard-reduction strategy, however, a more effective approach may be to burn for a mosaic throughout the ecosystem. This may reduce the overall fuel of the system, as well has have added benefits for the environment. 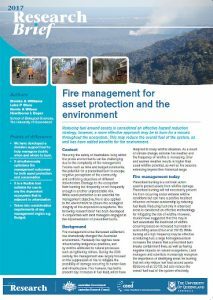 Land managers and scientists increasingly recognise the importance of identifying areas for burning that not only reduces fuel load around assets, but also effectively reduce the overall fuel load of the system. CEED researchers are helping in identifying these areas by developing a decision-support framework for planning prescribed burning. 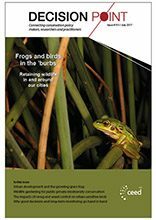 They have applied this to the dry sclerophyll forests of southeast Queensland in collaboration with the City of Gold Coast (Williams et al, 2017). The team has quantified the trade-offs between asset protection and conservation objectives and show that it is possible to achieve good outcomes for conservation with minimal impact on asset protection. Their framework also improves asset protection by identifying a better distribution of prescribed burns in space and time. This work provides a transparent, objective and flexible framework that can be applied to many different prescribed burn scheduling problems at large spatial scales.